During last week’s study, the apostle Paul gave glory to God by blessing the Father who has blessed us with every spiritual blessing in Christ (note the varied, three-fold use of the phrase “to the praise of His glory” at the end of each section for all three Persons of the Trinity: Father, Son, and Holy Spirit; Eph. 1:6; 1:12; 1:14). Verse 1:10, a fitting theme verse for the entire letter, reveals the Father’s ultimate end-goal in His plan to reconcile the entire redeemable creation under the supreme authority and rulership of His beloved Son, Jesus (cf. 1:6). The Church, the body of Christ, plays a key role in this current age as the world moves closer toward the climax and birth of God’s kingdom on earth (a.k.a. “the dispensation of the fullness of the times”). In this next section (1:15–23), we will look at how Paul further develops his opening message. As is the case with every passage of Scripture (2 Timothy 3:15–16), there are applications for daily living within this text, not only for Paul’s original readers, but also for those of us today who are also chosen by the Father, redeemed by the Son, and sealed by the Spirit. Paul shifts to speaking in the first person here: “...I heard of your faith…[I] give thanks for you...in my prayers.” The spiritual blessings given by the Father previously described in 1:3–14 have been received by the Ephesians, and the evidence for their status as children of God can be seen in their abiding trust in Jesus and their continuing love for fellow believers (cf. John 13:34–35; 1 John 5:1–2). The main takeaway from this first section is the idea that faith and love are linked together. Faith/trust in the Lord Jesus should also coincide with love for all believers. In other words, “A proper relationship with God should lead to a proper relationship with other Christians” (see also Eph. 6:23, where Paul again links “faith with love”). * Also, it is worth noting that Paul gives thanks to God for his brothers and sisters in the faith and prays on their behalf. This must have meant the world to them, especially considering Paul’s status as an apostle and knowing that he had spent so much time in Ephesus laying the foundation of the gospel (see Acts 18:19–22; 19:1–41; 20:17–38). *Harold Hoehner, "Ephesians," in The Bible Knowledge Commentary, 619. Here Paul reveals the content of his intercessory prayer on behalf of the Ephesian believers. Essentially, the apostle has their spiritual growth in mind, and he isn’t so much praying for God to give them something they don’t already have; rather, he wants these beloved children of God to realize with greater clarity what they’ve already been given through Christ (refer back to Eph. 1:3). Following the pattern above, we can see that a believer’s first priority is growing in their relationship with God (see v.17, “wisdom and revelation in the knowledge of Him”). One can’t know God personally without the Spirit of God awakening them first—this is what Paul refers to as “the eyes of your heart being enlightened” (v. 18). For a helpful cross-reference, see 1 Corinthians 2:12–14. As the believer grows in this loving relationship with God, he or she should become more and more hopeful,* visualizing a glorious future among God’s treasured people (His inheritance),** and learning to access His immense power available for every trial in this life. *** The final four verses in this week’s section will expand on the last point of Paul’s prayer about God’s limitless power for believers in the body of Christ. *See also Romans 5:5. There is no other hope for mankind other than this calling from God to become His own special possession. Paul echoes this in Ephesians 2:12: believers were once "without hope," and in Eph. 4:4: there is "one hope" to which they were called. Also, Paul clarifies in Colossians 1:27 that this one solitary hope for every believer is not based on present circumstances, personal dreams, or material possessions; on the contrary, Christ's presence in the believer is the hope of their [future] glory in heaven. **Every believer is precious and valuable in God's sight; see the New Living Translation's take on verse 18, "...his holy people who are his rich and glorious inheritance" (Eph. 1:18, NLT). Like Jesus, who is rejected by the world but chosen and valuable to God, we are precious gems and also called "living stones" (1 Pet. 2:4–5). ***In verse 19, Paul uses an excess of four different Greek words that refer to God's power: dunamis, energeia, kratos, and ischus. You might recognize a couple of these words in English: dunamis (dynamite) and energeia (energy). Kuruvilla adds,"...this piling on of synonyms effectively emphasizes the incomparability of divine power" (45). Carrying over from the end of verse 19, the Father’s mighty power works [Grk. energeia] at the present time for believers, and it is the same mighty power that He worked [energeia] at the time of Jesus’ resurrection and ascension to heaven! 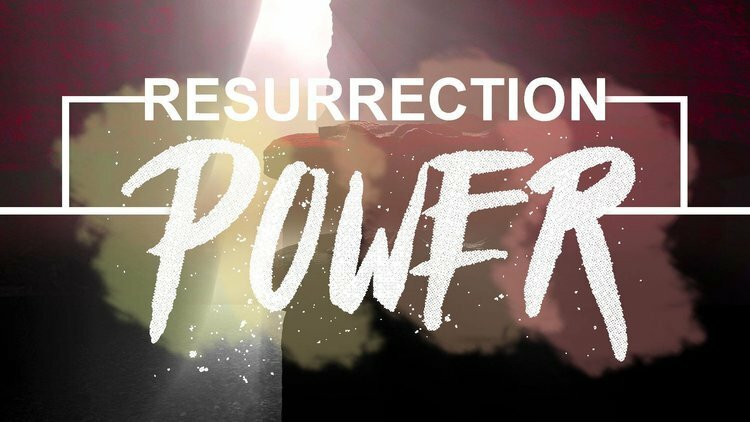 Paul also refers to this “resurrection power” in Romans 8:11 and Philippians 3:10. While believers still carry around the flesh [i.e. what the apostle calls “the old man” in Eph. 4:22], they are to live in light of Christ’s resurrection/exaltation and draw strength from their risen Lord instead of former corrupting desires and passions. Where Adam failed as head of the first humanity, Jesus succeeds and is now head of a new humanity (cf. Rom. 5:12, 17). Hebrews 2:5–8 sheds further light on Ephesians 1:22 and explains why evil powers are still ruling in the world today even after the triumph of the cross and resurrection of Jesus; see especially Heb. 2:8, “...when he [the Father] put all things under his control, he left nothing outside of his control. At present we do not yet see all things under his control." One day soon, however, there is going to be an end to the corrupt rule of these evil powers, both natural and supernatural. The apostle John records the time when all things will finally come under Jesus’ authority, “Then the seventh angel blew his trumpet, and there were loud voices in heaven, saying, ‘The kingdom of the world has become the kingdom of our Lord and of his Christ, and he shall reign forever and ever” (Revelation 11:15, ESV). *Most of us are familiar with the Church being called Christ's body, but what does it mean to be His fullness? Kuruvilla provides a helpful answer, "It is very likely that the idea of pleroma [fullness] in Ephesians refracts the OT concept of divine presence, akin to God's Shekinah glory...'fullness' then is the presence and power of God. In the OT he filled the sanctuary, now in Christ, he fills the church that thereby partakes of the divine fullness..." (48). See also Isa. 6:3; Jer. 23:24; and 2 Chron. 5:13–14. **Paul appears to make a deliberate play-on-words, linking 1:10 to 1:22. 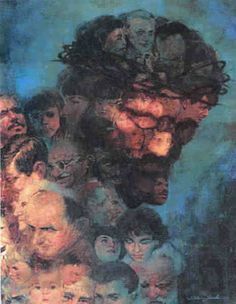 In verse 22, Christ is "head" [Grk. kephala], and in verse 10, there is one word in the Greek that is translated in the NKJV as "gather together in one" [anakephalaioo]. This word in 1:10 has the same root, kephala, "head" (1:22), and can be literally translated as "God will head up all things in Christ." "The Church manifests God’s incomparable power [and], as the fullness of Christ, it expresses his divine rule in this age" (Kuruvilla, 50). 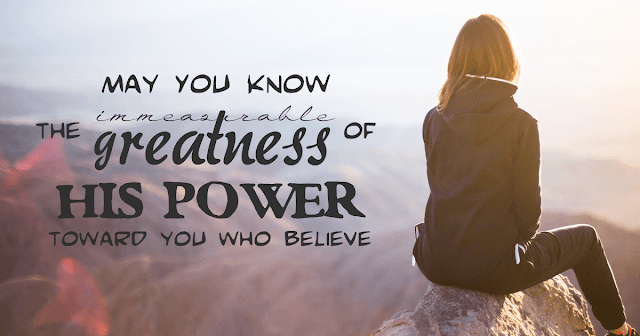 Have you ever struggled with thoughts, feelings, and experiences of powerlessness, defeat, and failure? This second week of our study through Ephesians should help to encourage every believer and remind them of their privileged position in the Father’s plan. Take heart, brother or sister in the Lord! You are a member of Christ’s body, and He is Lord and Ruler over all things. If you feel empty and worn down, then understand that He is the One that fills you up (cf. Eph. 5:18; Col. 2:10)! *See also 2 Corinthians 1:8–10; the Holy Spirit speaks through Paul to relay a similar message to anyone who is in deep despair: Trust in God who raises the dead, not in your own resources! "note the varied, three-fold use of the phrase “to the praise of His glory” at the end of each section for all three Persons of the Trinity: Father, Son, and Holy Spirit; Eph. 1:6; 1:12; 1:14"
1. Father - vv. 3-6: "God and Father"... to the praise of His glorious grace. 2. Son - vv. 7-12: "in Him" [the Son]... for the praise of His glory. 3. Holy Spirit - vv. 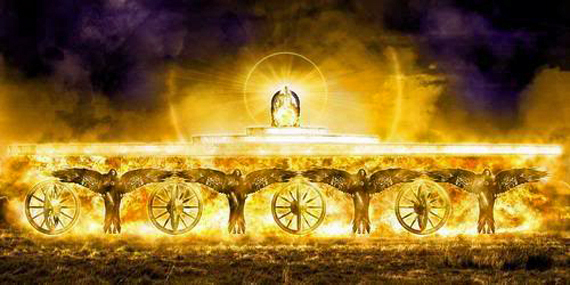 13-14: "the promised Holy Spirit, who is a deposit"... to the praise of His glory. But, Gary! Where does it say "Trinity" in the Bible? 27 He will confirm a covenant with many for one ‘seven.’[a] In the middle of the ‘seven’[b] he will put an end to sacrifice and offering. And at the temple[c] he will set up an abomination that causes desolation, until the end that is decreed is poured out on him. JOEL 3 - Nations Judged. Guess what ! I see the build up and fulfillment of this. ICYMI - The United Nations Assigned Palestine - Mahmoud Abbas to lead the 77 countries (Note the number)...remember there should be a "deal with many" and since "the Many" is now REPRESENTED by Palestine, the Daniel 9:27 becomes even realistic and simultaneously fulfilling the DIVISION of ISRAEL on JOEL 3 in which we speculate part of the 'PEACE PLAN' where we believe will include the 3rd Temple with compromise of Jerusalem division. Also Pray for me for spiritual strength as I face battle. I hadn't heard of that before (the G-77). It's amazing that Palestine isn't even a nation and yet the idiotic leaders of the world have made it the chair of a group of 77 nations. Thank you for sharing, Ryan. We'll pray for you, brother. Exactly Gary , Palestine is the most unqualified country to head this G77. But because I believe that what is written in scripture must be fulfilled. Again , the convergence of signs during the closing months of the 70th year of Israel. Also, if "the many" is represented by Palestine for the upcoming division of Jerusalem, the compromise is even possible to see today in reference to the 3rd Temple. Read Joel 3, and on Joel 2, Locust attacked. Is it related to the Locusts of Saudi just two weeks ago. Considering that Saudi is the most influential Islamic nation to convince Palestine for the "Peace Plan"
Ryan did you say 3rd Temple? Note the 666 - Tel Aviv Skyscraper: Remake of Tower of Babel or Preparation for Third Temple? One of the largest real-estate developers in Israel revealed plans for the soon-to-be tallest building in Israel that looks surprisingly similar to images of what the Tower of Babel may have looked like...one rabbi thinks could be a dry-run for building the Third Temple. It would be Israel’s tallest building, 91 stories and 1,150 feet high. The Spiral Tower will take six years to complete at an estimated cost of $666 million. The new tower will take its place next to the iconic circle, square and triangle towers that make up the Azrieli Complex. Creepy and you're right... it does look like several classic depictions of the T.o.B. Besides Israeli elections and the possible peace deal, add to the March-May timeframe that Brexit's waiting period is over and a no-deal exit may happen. The UK was always the odd man out. Once/if they leave, the EU will have little preventing a federation, except Italy and Hungary. Hungary may just up and leave anyway.